Hello and happy Monday, my friends! As you know, it’s Cyber Monday and while I am still holding my Black Friday offer in my Shop today as well, I also wanted to tell you about another really cool deal that’s ending today. You don’t want to miss this one if you’ve been planning to start a new website or blog, or update your current site. Note: There are affiliate links listed in this email meaning if you purchase I will make a percentage of commission. Please know I only recommend products and services I use and love! I wanted to share a product that I’ve been using for my business that has truly helped me and a lot of my clients: Bluchic WordPress themes. I’ve been building sites on WordPress for about 10 years now and all of my recent websites (including this one) are built on WordPress. I love how easy it is to build, customize and make posts and pages on this platform. It’s also really easy for my clients to learn, even if they have no previous technical knowledge. But the biggest hangup with WordPress today is finding the right theme. There are LOADS of themes out there. A quick search on Google will show you more free WordPress themes than you know what to do with. If you’ve ever tried to find a theme this way before, you will know that all WordPress themes are NOT created equal. Sometimes you get one for free and it has none of the features you need or want. Or, it looks great until you install it and no matter what you do, you can’t get it to look like the demo. It’s so frustrating! Finding developers that offer great WordPress themes I can use with my clients is really important to me. That’s why I was so happy to stumble across Bluchic completely by accident one day. Since then, I refer them to everyone I know. I work with a lot of female entrepreneurs and the colors and designs of these themes really fit their needs. They can also be customized however you wish and the colors can be changed to meet your own needs, but right out of the box they are ready to use. I really love these themes because they are pretty much plug-n-play. Features include responsive design, online shop capability, sleek and professional design, SEO optimized, easy to implement, great documentation, and there’s only a one-time fee. You buy it and it’s yours. Install it and run with it. No more to pay ever. 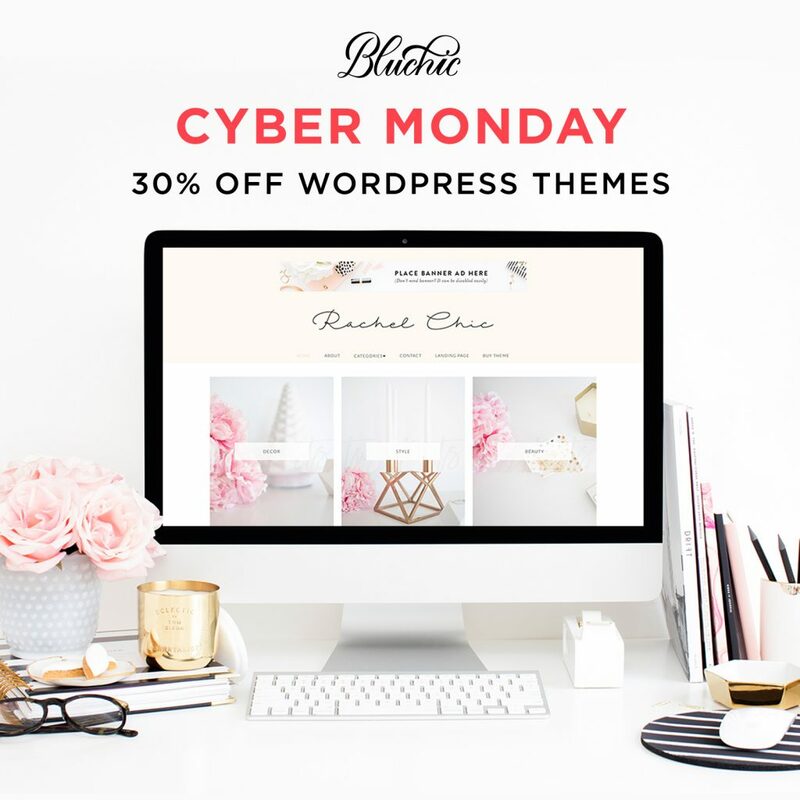 Right now, Bluchic is offering 30% off for Black Friday/Cyber Monday, so if you’ve been wanting to give your website a facelift, now’s the time to buy! This offer is only good for Thursday, November 22 until Monday, November 26 at 11:59 pm EST. Start browsing the Bluchic WordPress themes now.